Dozens of homes were left without a water supply after a pipe burst in Plymouth. The water services company discharged poor quality effluent from two of its sewage treatment plants into watercourses near Cornwall & Devon. There is no water in the Porthpean area while South West Water carry out "urgent repairs" on a burst water main. The works are expected to last 4-6 hours with the water coming back on at 1.30pm. South West Water must improve its performance according to a "Water and sewerage companies' performance" report by The Environment Agency. South West Water has been ordered to pay £54,000 in fines and costs after it allowed untreated sewage to escape from a pumping station. Homes in parts of St Austell could be experiencing problems with water supplies this morning after a mains burst at Sandy Hill Academy. South West Water say they've sent a repair team. Bathing water at beaches in Newquay could be affected by a problem with the main sewage pumping station in the town. South West Water is doing its best to fix it but you may want to reconsider your New Year's Day dips. Water should be back to normal in Plymouth this morning, after thousands of homes were affected by Thursday's burst water pipe, which also caused traffic chaos in the city. 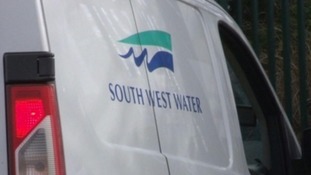 South West Water finished repairing the pipe on Thursday evening, and announced this morning that water was back in people's homes. People are being advised to run the tap if there's any discolouration. If your water is white, cloudy or appears to have tiny bubbles this is due to air in the water and is a result of the network returning to normal. https://www.southwestwater.co.uk/index.cfm?articleid=11232 Please be assure that the water is perfectly safe to drink and use. We are continuing to monitor water supplies throughout the day." 4,000 homes in Plymouth have been affected by a major water pipe burst, causing traffic chaos during morning rush hour. It happened on Tavistock Road at 6.30 this morning. South West Water has begun to repair the pipe, but supplies in Crownhill, Whitleigh and Efford are affected. The company says it is arranging alternative water supplies, and is posting updates at www.southwestwater.co.uk/waterlive and on its Twitter. The water on the road is subsiding, but drivers in the area are being advised to take care. Public transport is gradually returning to normal after major delays all morning. South West Water has said customers may experience low pressure or discolouration this morning, due to a burst water pipe in St Ives. Although teams worked overnight to fix the leak the company has warned the pressure will take a while to return to normal. Those affected are advised to run the cold tap in the kitchen until the water runs clear.